The PML (N)’s official election symbol (that appeared on the ballot paper) is that of a Bengal Tiger, which are not lions but tigers. The Bengal Tiger is an endangered species with fewer than 2,500 left in the wild (mostly in India, Bangladesh and Nepal). They are no longer found in the wild in our part of the subcontinent – the last known Bengal Tiger in Pakistan was shot dead in 1906 near Bahawalpur, according to British records. You can, however, find them in zoos and some private facilities in the country where they are supposed to be used for educational purposes, and certainly not for political campaigning! 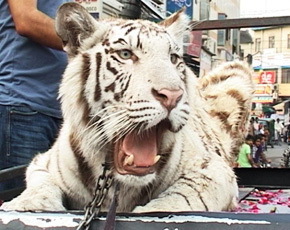 The white tigress that was paraded during PML(N) rallies in Lahore in the run-up to the elections had recessive gene mutation. The white tiger is a recessive mutant of the Bengal Tiger. The white tigress first came to the public’s notice when she was brought to the University of Veterinary and Animal Sciences (UVAS) in Lahore on May 7, 2013. She was exhausted, and in fact severely dehydrated. In the last few days leading up to May 11, the temperature in Lahore had reached 40 degrees Celsius and the young white tigress had been dragged to many of the PML(N) rallies, often being chained in the open back of a Vigo. The tigress belonged to the family of former PML(N) MNA, Mian Marghoob, who owns a large farm in Mehmood Booti in Lahore. In his compound are three other tigers – two are orange-coated Bengal tigers and there is one more white tigress, a large female called Sandy. UVAS has a pet center, an open facility where people can bring in their pets for treatment. The vets there diagnosed a more serious condition: pulmonary effusion (water in the lungs). They gave the white tigress intravenous therapy and noted that she looked seriously underfed, with a shrunken face. Since they could not keep her overnight, as they don’t have those kinds of facilities, after a few hours they sent her back to Mehmood Booti with her keepers. Later they were pressurised to say to the media that the tigress was not seriously ill but “in good health”, merely suffering from a cough. A photo, however, was taken of the listless white tigress lying on the floor while at UVAS. That was when word got out to the media that the tigress was very ill and weak, and probably dying. Maryam Nawaz then denied on Twitter that the tiger was dead, while a doctor contradicted others at the University and also said the tiger was well – but the poor animal was still nowhere to be seen and confusion remained. 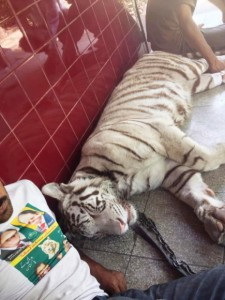 The episode calls into question how the tiger was being used at the rally, in conditions that were nowhere near approximate to his natural habitat. According to WWF, white tigers are endangered and are extremely sensitive to heat and noise. A rally at the peak of summer in Punjab is likely to be noisy and suffocating. Meanwhile, journalists began calling up Mian Marghoob and his relatives, Mian Idris and Mian Zia, inquiring about the tigress. The owners of the tigress, panicking at the thought of a media trial focusing on the poor treatment of the tigress and the embarrassment of the PML(N) election symbol “dying” before May 11th, came up with their own strategy. They invited the most well-known journalist who works for the BBC to visit Mehmood Bhooti and see for himself that the tigress was in fact alive. The journalist, who saw the older white tigress Sandy padding up and down in her concrete and mesh den reported that: “after seeing the tiger in its den, the BBC can confirm it is still alive. It is in fact in rude good health”. The BBC journalist had no idea that there were in fact two white tigresses owned by Mian Marghoob’s family and never asked to see the smaller one. He never asked to be taken to the facility in the back of the compound where the sick (and perhaps dead) tigress was being kept. There is in fact, a simple way of verifying if the smaller white tigress is still alive and well. According to WWF Biodiversity Director Uzma Khan, “Every tiger has a different pattern of stripes on it, just like humans have different fingerprints, so if that tigress is still well and alive, why don’t they bring it over or send fresh pictures to the WWF?” She says she can identify the smaller tigress from a distinctive triangular mark on her left hind leg. The stripe pattern analysis is actually enough to identify if she is indeed alive or dead. All that is needed is a recent picture to compare with the one that was taken at UVAS. The BBC took pictures of Sandy, the bigger tigress, and they can easily compare her stripes with the picture of the smaller white tigress at UVAS. This might be all the proof we have, since Mian Marghoob’s family is now saying that the smaller tigress will no longer come out to take part in rallies. But perhaps the bigger issue is not whether she is still alive or dead, but that the tigers at Mehmood Booti and other wild animals used during PML(N) campaigns – there were 3 lions on a truck on MM Alam road during a victory rally just a few days ago – are kept in poor conditions, paraded around and probably drugged during rallies. The lions on MM Alam road were being goaded to roar by sticks during the victory rally. “These are not domestic animals, they are wild animals with wild instincts and they cannot cope with all the loud sounds and mistreatment at rallies”, explains Uzma Khan. She points out that under the CITES (Convention on International Trade in Endangered Species of Wild Fauna and Flora) guidelines on the “Acquisition and Management of Big Cats in Captivity” which were approved by the Ministry of Climate Change in 2011, it is prohibited to take big cats to public places in a cage or a leash. She adds, “CITES says in order to import a big cat you have to ensure proper care”. Wildlife farms that have licenses for keeping and breeding wildlife have to be monitored carefully by wildlife officials who should visit the facility regularly to ensure that it is up to the mark. “Captive animals are supposed to be used for public education, so that people can learn about conservation”. They are certainly not supposed to be used for campaigning purposes, and it is really pathetic that they are being used as an election symbol to make some of our political leaders look more fierce and aggressive. If our newly elected political leaders really want to prove that they are wiser and more civilized this time around they should stop their followers from abusing these wild animals. In disgust, the activist and animal lover, Feryal Gauhar filed a writ petition in the Lahore High Court seeking to uphold the CITES guidelines. The court has called WWF-Pakistan to appear as an expert organisation, along with other organisations like the Punjab Wildlife Department. The first hearing has taken place already by the Green Bench in Lahore headed by Justice Mansoor Ali Shah. The complainant would like to see a ban on displaying big cats in rallies and improvements in private facility inspections. The Election Commission of Pakistan will be called as well since they are the ones who agreed to awarding the “sher” as an election symbol in the first place. The Constitution places a duty on the ECP under Article 218 (3) to organise and conduct elections and to make arrangements as are necessary to ensure that “the election is conducted honestly, justly, fairly and in accordance with law”, and that corrupt practices are guarded against. In addition, Article 220 of the Constitution places mandatory duty of all executive authorities in the federation and the provinces to assist the ECP in discharge of its functions. No election can be fair if a major political party is allowed to flout the law of the land. In the same vein Sir, no nation can be considered civilised unless the right to life, freedom, and dignity is afforded to all living creatures unless considered a threat to the lives of others. The big cats species of wild felids (cats) that primarily include lions, tigers, cheetahs and leopards etc. are threatened. These species are an irreplaceable part of our ecosystem. The Convention on International Trade in Endangered Species of Wild Fauna and Flora of 1973 (CITES) was first acceded by the Government of Pakistan in 1976 and later adopted in the form of legislation by the Parliament through the Pakistan Trade Control of Wild Fauna and Flora Act of 2012 (the “2012 Act”) by virtue of which a body, CITES Management Authority under Federal Ministry of Climate Change, was formally declared in Pakistan as per Article IX of CITES. 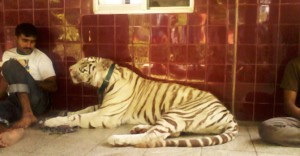 In June 2011, the Federal Ministry of Climate Change (then the Federal Ministry of Environment) approved ‘Guidelines for the Acquisition and Management of Wild Felids in Captivity’ after consulting all provincial wildlife departments and leading environmental conservation organisations such as WWF-Pakistan and IUCN Pakistan. Sir, unfortunately, we are not a nation given to protecting or even acknowledging the rights of the powerless, the voiceless. You are held in extremely high esteem by people such as myself, an ordinary citizen of an extraordinary country where millions eke out an existence from the crumbs thrown at them by the largesse of “elected representatives”. I am placing my faith in your ability to understand that I am speaking on behalf of animals because it is imperative to my conscience that I do so. I raise my voice today because amongst the din and clamour of electioneering, deal-making, reality-fixing, spin-doctoring, and promise-making, I stand firm in my belief that the civilising signifier of a nation is in how that nation treats the powerless, the voiceless. I am confident that our people shall be able to fight terror, oppression, lies, and exploitation. But Sir, I fear that these animals cannot do the same. They cannot take off the burdensome chains which cut into their flesh, they cannot gnaw their way out of the iron cages which imprison them, they cannot protect themselves from the onslaught to their dignity by gawping and heckling spectators. The flagrant display of wild animals on roads and public places is not only illegal but also against the norms of any civilised society. The presence of endangered species in massive public gatherings while being leashed and caged amounts to cruel treatment and is a visible exploitation of globally protected species. Furthermore it threatens the security of the general public who attend these rallies, or happen to be in the vicinity. This practice also damages the international image of Pakistan in the comity of civilised nations. With this letter I request the ECP to include in the Code of Conduct for the electoral process, the prohibition of any misuse and display of any animal by all political parties. The competent authorities at both federal and provincial levels should be instructed to take appropriate action in case such violations of the law take place where cruel treatment is meted out to animals and the safety of the public is endangered. It is a sad state of an affair to note that while Pakistan with its upcoming general election continues to move forward on its path to democracy, a rarity during the sixty years of its existence, but a candidate’s action of bringing a Siberian tiger into the campaign to attract a crowd, is inexcusable and unjust. I have nothing but a disdain for Nawaz Sharif a former Prime Minister of Pakistan (and possibly a second-time Prime Minister if he is elected) for playing this stunt to attract the crowd. The poor tiger tied in a chain is being tossed around from rallies to rallies on a roof-top of a car in this 100-plus degree Fahrenheit temperature of Lahore (Pakistan). A recent report that the tiger died of sheer exhaustion has been denied, and is strongly condemned by the Sharif’s party, which has also demanded an apology from the originator of the report as — if the inhumane treatment and exploitation of the tiger as it is being carried out is an OK thing to do. Place for wild animals is in the “wild,” or in case of the loss of their habitat, they should be placed in some animal sanctuary within the country or in any other country where such a facility exists. Under no circumstances, these animals should be under the command of a private collector. We do not know how many more chained and probably de-clawed and toothless tigers there are, in the collection of the Sharif Family, but we do know at least two stuffed tigers do guard the entrance of Sharif’s mansion whom he so proudly shows off. With leaders like these, what can be expected from the public when it comes to giving these magnificent and endangered animals the care and respect they deserve? In India, Election Commission of India, located at Nirvachan Sadan, Ashoka Road, New Delhi-110001, through its letter F. No. 56/Misc./2012 Dated: 19th September, 2012, addressed to all the Presidents/General Secretaries of all the Recognised National and State Political Parties prohibited use of animals in election process. Thge letter stated that the Commission has received representations from certain individuals and organisations alleging that animals like horses, ponies, donkeys, elephants, camels, bulls, etc. are subjected to cruelty in different ways, in connection with election campaign. It is alleged that the animals are often made to carry loads beyond permissible limits, made to work for long hours, and some candidates even paint slogans and election symbols on animals using harmful chemicals. The letter said that the Commission has considered the matter. The cadres/workers of political parties and candidates, in their enthusiasm, should not lose sight of the legal provisions dealing with cruelty to animals. Article 51 A (g) of the Constitution of India calls for compassion for living creatures and the Prevention of Cruelty to Animals Act, 1960 and Wildlife Protection Act, 1972 prohibit over- drives, over loads and torture of animals. Further, the use of animals for work is regulated by the Prevention of Cruelty to Draught and Pack Animals Rules, 1965. Having regard to the above, the Commission advised the Political Parties and candidates that they should refrain from using any animals for election campaign in any manner. If at all use of animals isunavoidable for any particular reason, they should ensure that there is no violation of any of the legal provisions mentioned in para 2 above and no cruelty in any form, is meted out to the animals. The Commission also invited the attention of the recognised political parties with reserved symbols depicting animal or bird, to the directions already given by the Commission in the past that they shall ensure that no cruelty is shown to that animal or bird in any manner, and no live demonstration of that animal or bird is made in any of the Party’s, or any of their candidates’ election campaign. for your blog. Youu have some really great osts and I feel I would be a ood asset. link back to mine. Pleasee shoot mme aan email iif interested.